Josef Casimir Hofmann (originally Józef Kazimierz Hofmann; January 20, 1876 – February 16, 1957) was a Polish American virtuoso pianist, composer, music teacher, and inventor. Josef Hofmann was born in Podgórze (a district of Kraków), in Austro-Hungarian Galicia (present-day Poland) in 1876. His father was the composer, conductor and pianist Kazimierz Hofmann, and his mother the singer Matylda Pindelska. A child prodigy, he gave a debut recital in Warsaw at the age of 5, and a long series of concerts throughout Europe and Scandinavia, culminating in a series of concerts in America in 1887-88 that elicited comparisons with the young Mozart and the young Mendelssohn. Anton Rubinstein took Hofmann as his only private student in 1892 and arranged the debut of his pupil in Hamburg, Germany in 1894. Hofmann toured and performed extensively over the next 50 years as one of the most celebrated pianists of the era. In 1913, he was presented with a set of keys to the city of St. Petersburg, Russia. As a composer, Hofmann published over one hundred works, many of those under the pseudonym Michel Dvorsky, including two piano concertos and ballet music. He made the United States his base during World War I and became a US citizen in 1926. In 1924, he became the first head of the piano department at the inception of the Curtis Institute of Music, Philadelphia, and became the Institute's director in 1927 and remained so until 1938. He was instrumental in recruiting illustrious musicians such as Efrem Zimbalist, Fritz Reiner, Marcella Sembrich, and Leopold Auer as Curtis faculty. Hofmann's pupils included Jean Behrend, Abram Chasins, Abbey Simon, Shura Cherkassky, Ezra Rachlin, Nadia Reisenberg (see ), and Harry Kaufman. While not a pupil, Jorge Bolet benefited from Hofmann's interest. In 1937, the 50th anniversary of his New York debut performance was celebrated with gala performances including a "Golden Jubilee" recital at the Metropolitan Opera, New York City. In 1938 he was forced to leave the Curtis Institute of Music over financial and administrative disputes. In the years from 1939 to 1946, his artistic eminence deteriorated, in part due to family difficulties and alcoholism. In 1946, he gave his last recital at Carnegie Hall, home to his 151 appearances, and retired to private life in 1948. He spent his last decade in Los Angeles in relative obscurity, working on inventions and keeping a steady correspondence with associates. As an inventor, Hofmann had over 70 patents, and his invention of pneumatic shock absorbers for cars and airplanes was commercially successful from 1905 to 1928. Other inventions included a windscreen wiper, a furnace that burned crude oil, a house that revolved with the sun, a device to record dynamics (U.S. patent number 1614984) in reproducing piano rolls that he perfected just as the roll companies went out of business, and piano action improvements adopted by the Steinway Company (U.S. patent number 2263088). Hofmann died of pneumonia on February 16, 1957 in Los Angeles. He was survived by four children. His second wife, Betty Short, had previously been one of his pupils. He is interred at Forest Lawn Memorial Park in Glendale, California. The Josef Hofmann Piano Competition, co-sponsored by the American Council for Polish Culture and the University of South Carolina Aiken was established in his honor in 1994. Hofmann as a young man at the keyboard. Anton Rubinstein heard the seven-year-old Hofmann play Beethoven's C minor Piano Concerto in Warsaw and declared him to be an unprecedented talent  . At Rubinstein's suggestion, German impresario Hermann Wolff offered career management and offered to send the boy on a European tour, but Hofmann's father refused to let the boy travel until he was nine years old. At that age, Hofmann gave concerts in Germany, France, Holland, Norway, Denmark, Sweden, and Great Britain. By the early 1930s, Hofmann had become an alcoholic but he retained exceptional pianistic command throughout this decade; Rudolf Serkin and a young Glenn Gould have recounted magical impressions created on them by Hofmann's concerts in mid-and-late 1930s. After his departure from the Curtis Institute in 1938, a combination of his drinking, marital problems and a loss of interest in performing caused a rapid deterioration in his artistic abilities. Commenting on Hofmann's sharp decline, Sergei Rachmaninoff said, "Hofmann is still sky high ... the greatest pianist alive if he is sober and in form. Otherwise, it is impossible to recognize the Hofmann of old". Oscar Levant wrote, "one of the terrible tragedies of music was the disintegration of Josef Hofmann as an artist. In his latter days, he became an alcoholic. …[H]is last public concert … was an ordeal for all of us". Josef Hofmann playing solos in the Metropolitan Opera House gala on November 28, 1937, the 50th anniversary of his American debut. Hofmann's views on technique and musicianship are explained in his book Piano Playing with Questions Answered. He had small but exceptionally strong hands. Steinway eventually built for him custom keyboards with slightly narrower keys (pianist/critic Stephen Hough has commented on how Hofmann's mechanical understanding of the Steinway piano action set him apart from all other pianists.) His concert instruments had subtle action changes for faster repetition, two pedals rather than three (he liked the older Steinway trap work geometry), faultless regulation, and were accompanied on tours by his own recital chair, built with a short folding back and a 1½" slope from rear to front. After playing Hofmann's special concert instrument in the Steinway New York basement, Gunnar Johansen reported that the piano had the biggest sonority of any he had ever tried. Unlike Rubinstein, Hofmann sat quietly at the piano, striking the keys in a kneading manner. His finger staccato was at the time unequaled, as was his orchestral sonority. According to his student Nadia Reisenberg, he continuously used a combination of finger pedalling and foot pedalling. The New York Times critic Harold C. Schonberg said Hofmann had all of Leopold Godowsky's technique, a claim approved by Godowsky himself. By his own admission, Sergei Rachmaninoff, in his 40s, prepared for a career as a concert pianist by practicing over 15 hours a day with the goal of attaining the level of Hofmann's technique. When pianist Ralph Berkowitz was asked if Vladimir Horowitz had the greatest technique of all the pianists he had heard, Berkowitz replied that Horowitz indeed was the supreme master of the technical parts of performance, but one older era pianist was his equal - Hofmann. Hofmann's approach and style can be summarized by his motto "an aristocrat never hurries". He often stated that Rubinstein and Moriz Rosenthal were the only pianists that influenced his art, and admired singers Mattia Battistini and Marcella Sembrich (see  and ). He adopted a more demonstrative style in live performances but a subtle and restrained style for his studio recordings; in both cases, he mostly adhered to the printed score, occasionally doubling left-hand octaves, and shunned sentimentality. He put spontaneity rather than structure foremost and admitted to Rachmaninoff that "I do not know how to build a composition ... occasionally, it happens to sound well". Schonberg wrote that among Hofmann's contemporaries, only Godowsky had the finish and refinement of Hofmann but lacked Hofmann's color, fire, and "red blood", while only Ferruccio Busoni and Rachmaninoff were ever mentioned by contemporaries as Hofmann's equals. After hearing a performance of Chopin's B minor Sonata by Hofmann, Rachmaninoff cut that piece from his own repertoire saying "not since Anton Rubinstein have I heard such titanic playing". Suggested examples illustrating Hofmann's style: and  (dedicated to him by Sigismond Stojowski). Hofmann's repertoire was mostly confined to music written before the start of the 20th century. Much like Rubinstein's seven historic recitals of 1885, he gave 21 consecutive concerts in St. Petersburg without repeating a single piece, playing 255 different works from memory during that marathon cycle in 1912–1913. In the diary his wife kept during his 1909 Russian tour, she mentions his raising his eyebrows when he saw Brahms' Handel Variations on a program—a piece he had not played or even looked at for two and a half years. He played the work at the concert without hesitation. Although a poor sight reader, he was said to possess the ability of Franz Liszt and Camille Saint-Saëns to hear a composition once and play it back correctly without seeing the printed notes. Rosina Lhévinne recalled that Hofmann heard her husband Josef Lhévinne play Liszt's Lorelei, a piece Hofmann had never heard but went on to play it "just like my Josef (Lhevinne)" for an encore at his concert later that day. Maurice Aronson, who served as Leopold Godowsky's assistant, recalled Hofmann learning Godowsky's Fledermaus transcription. Godowsky and Hofmann met in Berlin in 1900, becoming friends until Godowsky's death in 1938. Hofmann would visit Godowsky's studio and listen while Godowsky was composing Fledermaus. A week later Hofmann visited Godowsky again and played the entire transcription, and he had never seen the music. Godowsky, in fact, had not yet written it down. Schonberg has added that Godowsky's Fledermaus is one of the most resourceful and complicated stunts ever written for the piano. Hofmann started recording in studios in the 1880s but was never satisfied with the available technology and made only test pressings after 1923; he considered the test pressings made for HMV in November 1935 to be a worthwhile representation of his art. In the 1940s he recorded for the Bell Telephone Hour radio programs of which some rare footage remains, including Rachmaninoff's Prelude in C-sharp minor, Op. 3, No. 2, and Beethoven's Concerto in E-flat major, "Emperor". Gregor Benko has remarked that Hofmann should not have appeared on many of the Bell Telephone Hour broadcasts since, by this time, his pianistic control had deteriorated considerably though the tonal palette was still immense and the phrasing provocative (see  and ). Hofmann's student Jeanne Behrend, after first hearing the recordings from 1940 to 1946, stated "well, it's his playing, but nothing like what we heard in the 1920s." Cylinders recorded c. 1890 for Thomas Edison were some of the earliest recordings of classical music and were lost during World War I. Four cylinders made in Russia in 1895–1896, with music by Mendelssohn, Louis Brassin and Rubinstein, have been recently discovered and issued on CD. He made two series of reproducing piano rolls, including in 1913 23 pieces for Welte-Mignon but did not trust rolls as an accurate representation of his playing. Hofmann recorded acoustic discs from 1912 to 1923 for Columbia and Brunswick, but felt the representation of his chaste and prismatic tonal palette was not captured. He did experiment with short studio test recordings in 1935, and in retirement in California experimented with piano string electrical pickups and designing an additional spruce soundboard under the piano lid. At least three of his concerts in 1930's were recorded live. These concert recordings exhibit an older Hofmann (age 60-62) in public just prior to the sharp decline in his pianistic command, and include sensational readings of Chopin's G minor Ballade, Andante Spianato and Grand Polonaise, A-flat Waltz (Op. 42) and F minor Ballade. All of these recordings have been published on compact discs under the auspices of Gregor Benko and audio restorer Ward Marston. 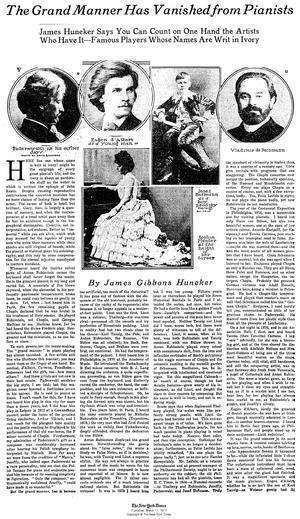 The 1917 New York Times article of James Huneker placing contemporary pianists, including Hofmann, in the context of the past legends. Harold C. Schonberg has argued that Hofmann was the most flawless and possibly the greatest pianist of the 20th century. HMV and RCA unsuccessfully pursued recording projects with Hofmann in the 1930s. Rachmaninoff dedicated his Piano Concerto No. 3 in D minor (1909) to Hofmann, although Hofmann disliked it and never played it. 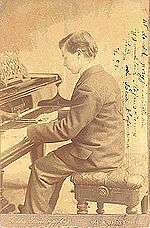 Older generation critics such as James Huneker labeled Hofmann the "king of pianists", and Samuel Chotzinoff called him the "greatest pianist of our time." Contemporaries such as Rachmaninoff, Ignaz Friedman, Josef Lhévinne, and Godowsky considered Hofmann to be, overall, the greatest pianist of their generation, but the acclaim was not so universal from the next generation of pianists. In his autobiography Arthur Rubinstein criticized Hofmann as someone who took interest in only the mechanics of music and not in its heart or spirituality, and commented that at the end of Hofmann's career "he was left with nothing after his technique left him". Claudio Arrau dismissed Hofmann (along with Paderewski) as someone who only happened to be very famous and said "I didn't know what to do with him". Sviatoslav Richter, after listening to a Hofmann RCA test pressing of the Scherzo from Beethoven's Sonata in E-flat, Op. 31, No. 3, considered the older pianist to be technically "stunning", but noted that Hofmann ignored the composer's sforzando markings; while György Sándor has called him the greatest of all 20th-century pianists in terms of music, interpretation, and technique. Hofmann's own student Shura Cherkassky compared Horowitz favorably with Hofmann as follows: "Hofmann was possibly the greater musical mind. But, I think, Horowitz was the greater pianist, the greater virtuoso—he somehow appealed to the whole world. Hofmann could not communicate on that level". ↑ Harold Schoenberg. The Greatest Pianist of His Time. New York Times, 18 April 1976. 1 2 "Nadia Reisenberg: Biography". Retrieved 19 July 2013. ↑ Rachlin, Ezra. "Josef Hofmann —A Unique Interpreter". Retrieved 19 July 2013. ↑ Hofmann, Josef. "Patent 1614984" (PDF). Retrieved 19 July 2013. ↑ Hofmann, Josef. "Patent 2263088" (PDF). Retrieved 19 July 2013. ↑ Hofmann, Josef. "Josef Hofmann". Retrieved 9 May 2010. ↑ "Josef Hofmann (1876 - 1957) - Find A Grave Memorial". www.findagrave.com. Retrieved 2016-02-28. ↑ Henry Charles Lahee. Famous Pianists of Today and Yesterday. Boston L.C. Press, 1900 (re-print 1906). Book contributor: Music - University of Toronto. ↑ Summers, Jonathan. "Josef Hofmann". Retrieved 26 July 2013. 1 2 Sergei Bertensson and Jay Leyda. Rachmaninoff: A Lifetime in Music. Indiana University Press, 2001. ↑ Oscar Levant. The Unimportance of Being Oscar, Pocket Books 1969 (reprint of G.P. Putnam 1968), p. 124. ISBN 0-671-77104-3. ↑ Hofmann, Josef (1920). Piano Playing with Questions Answered. Philadelphia: Theodor Presser. Retrieved 31 July 2009. 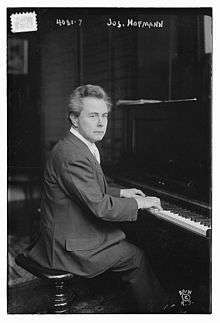 ↑ "Why was Josef Hofmann considered the greatest pianist of all?". The Daily Telegraph. London. 2009-09-17. Retrieved 2010-05-07. ↑ Wakin, Daniel J. (2008-10-26). "Classical Ghosts, Audible Once Again". The New York Times. Retrieved 2010-05-07. ↑ The Art of Piano: Great Pianists of the 20th Century. DVD released by Warner Music Vision, August 2002. Wikimedia Commons has media related to Josef Hofmann. Wikisource has the text of a 1921 Collier's Encyclopedia article about Josef Hofmann.